This state­ment is being issued on the 28th of Decem­ber 2017 and super­sedes all pre­vi­ous state­ments on the sub­ject. It has now has reached us with great regret and sad­ness that the eru­dite Schol­ar, Shaykh Hasan Bod­han­vi (RA) just passed away at Wal­sall (UK). Death of a Schol­ar is a calami­ty in its own right but pass­ing away of a great per­son­al­i­ty such as Shaykh Hasan Bod­han­vi (RA) is an irre­place­able loss to the Mus­lim Ummah. We make Dua for Allah Ta’ala to for­give his sins and grant him the par­adise (Ameen). Hadhrat Shaykh Maulana Muham­mad Hasan (Damat Barakatuhum) was born in Bod­han Gujarat India in the year 1930. His father’s name was Yusuf (Rah­mat­ul­lah Alaih). His father besides being punc­tu­al of his oblig­a­tory duties was also very punc­tu­al in pray­ing Nawafil (supereroga­to­ry) prayers par­tic­u­lar­ly the night­ly (Taha­jjud) prayers, the Chasht and the Awwabin prayers. He passed away when Shaykh (DB) was about 12 years old. His father expressed his wish­es before pass­ing away to the rel­a­tives who came to meet him that he want­ed to make his son an Alim (schol­ar of Islam). At birth Shaykh (DB) was giv­en the name Hasan. How­ev­er, when he went to study in Jamia Islamia Tal­im uddin Dab­hel his Ustaadh (teacher) Maulana Abdul Jab­bar Azmi (RA) stat­ed that anoth­er name before or after Hasan should be added, so his Ustaadh start­ed call­ing him Muham­mad Hasan and Shaykh (DB) became well known by the name of Muham­mad Hasan. Shaykh (DB) com­plet­ed his Hifdh (mem­o­ri­sa­tion) of the Qur’aan Majeed in about a year. His father would wake him up for Taha­jjud Salah at about 3AM. Shaykh’s (DB) father prayed Taha­jjud Salah while Shaykh (DB) would mem­o­rise his Hifz les­son, before going to Madrasah Shaykh (DB) would recite his les­son to his father dai­ly. Shaykh (DB) com­plet­ed his first year of Per­sian by Maulana Musa Ame­ji (RA) in Bod­han and then enrolled in the Madrasah Jamia Islamia Tal­im uddin Dab­hel in the year 1943 and stud­ied for a fur­ther 8 years. At the time, the Mohtamim (rec­tor) of the Madrasah was also one of Hadhrat’s teach­ers. He was the Grand Mufti of Gujarat, Mufti Isma’il Bis­mil­lah (RA). Shaykh (DB) grad­u­at­ed as an Alim from Jamia Islamia Tal­im uddin Dab­hel in the year 1951. Dur­ing Shaykh’s (DB) stay in Jamia Islamia Tal­im uddin Dab­hel he always used to come first in his class. Names of some of the notable Schol­ars from whom Shaykh (DB) ben­e­fit­ed dur­ing his stay in Jamia Islamia Tal­im uddin Dab­hel are Mufti Isma’il Bis­mil­lah (Rah­mat­ul­lah Alaih), Maulana Yusuf Bin­nori (RA), Maulana Abdul Jab­bar Azmi (RA), Maulana Sham­sud­din Bar­o­d­vi (RA), Maulana Ibrahim Chin­ta­man (RA), Maulana Abdul Raouf Peshawari (RA) etc. Shaykh (DB) then enrolled in Darul Uloom Deoband to fur­ther his stud­ies of Hadeeth. Names of some of the notable Schol­ars from whom Hadhrat ben­e­fit­ed dur­ing his stay in Darul Uloom Deoband are Shaykhul Islam Hadhrat Maulana Syed Husain Ahmad Madani (RA), Maulana Ezaz Ali (RA), Maulana Ibrahim Balyawi (RA), Maulana Qari Muham­mad Hifz ur Rah­man (RA). Upon com­ple­tion of his stud­ies, Shaykhul Islam Hadhrat Maulana Syed Husain Ahmad Madani (RA) gave Shaykh (DB) spe­cial writ­ten Ijaazah of الاجازة المسندة لساءر الكتب والفنون المتداولة (Per­mis­sion of all the Kitaabs and Sci­ences which are taught in the cur­ricu­lum of Darul Uloom), Shaykh (DB) was also giv­en spe­cial Ijaazah (per­mis­sion) of Amaliy­at by Shaykhul Islam Hadhrat Maulana Syed Husain Ahmad Madani (RA). Shaykh (DB) then went to Maza­hir e Uloom Saha­ran­pur where he par­tic­i­pat­ed in the Dars (Lessons) of Hadhrat Maulana Zakaria Kand­helvi (RA). Hadhrat Maulana Zakaria Kand­helvi (RA) had a lot of love for Shaykh (DB) ‚dur­ing les­son he would make Shaykh (DB) sit at the front with him­self and not with the stu­dents. 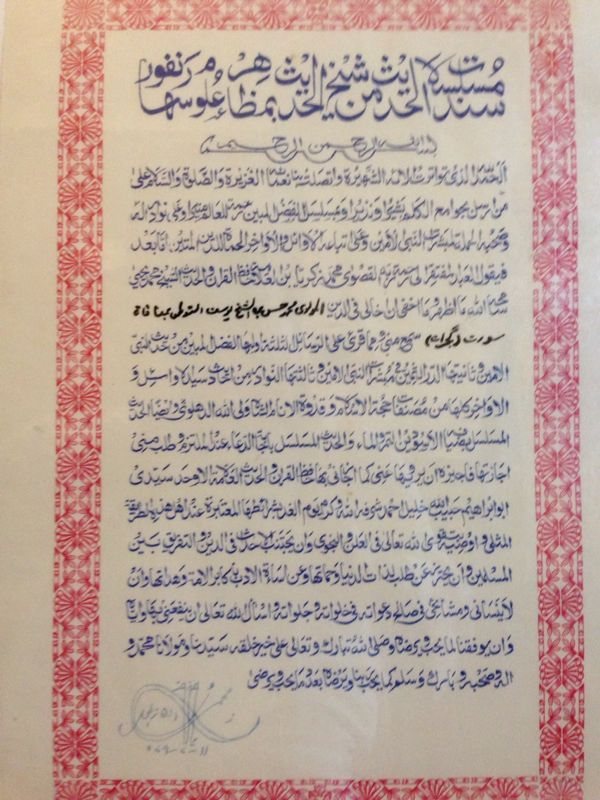 Hadhrat Maulana Zakaria Kand­helvi (RA) gave Shaykh (DB) writ­ten Ijaazah of Hadith Sha­reef. Shaykh (DB) also had the oppor­tu­ni­ty of serv­ing Hadhrat Maulana Zakaria Kand­helvi (RA) and par­tic­i­pat­ed in meals with him. Shaykh (DB) became Bay’at to Shaykhul Islam Hadhrat Maulana Syed Husain Ahmad Madani (RA) when he went to study in Darul Uloom Deoband in the year 1952. After get­ting Bay’at to Shaykhul Islam Hadhrat Maulana Syed Husain Ahmad Madani (RA), Shaykh (DB) would go to Deoband to ben­e­fit from Shaykhul Islam Hadhrat Maulana Syed Husain Ahmad Madani (RA). Shaykh (DB) would do the pre­scribed Adhkar and attend the Majlis of Shaykhul Islam Hadhrat Maulana Syed Husain Ahmad Madani (RA) which used to take place after Asar Salah. 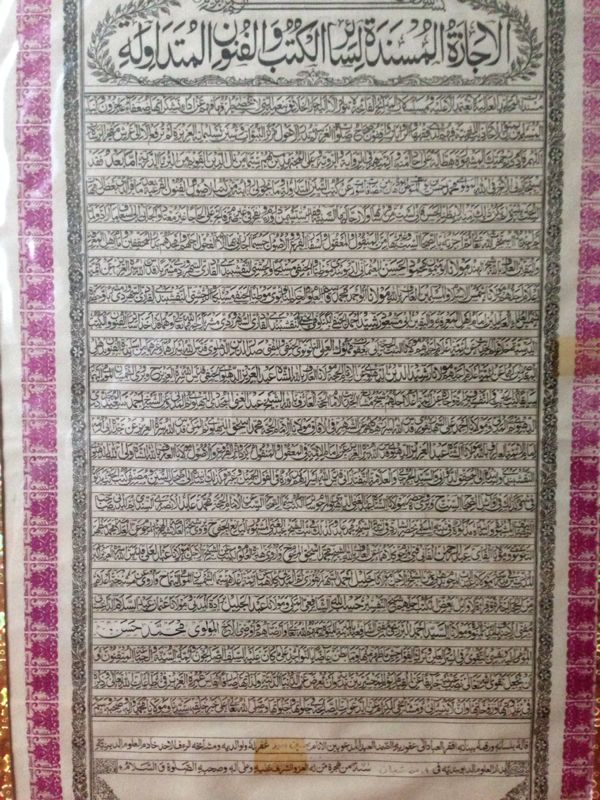 Shaykh (DB) took the Adhkar up to Muraqa­ba from Shaykhul Islam Hadhrat Maulana Syed Husain Ahmad Madani (RA). Shaykhul Islam Hadhrat Maulana Syed Husain Ahmad Madani (RA) also gave per­mis­sion to Shaykh (DB) to lead the Zikr Majlis. Shaykh (DB) was Bay’at to Shaykhul Islam Hadhrat Maulana Syed Husain Ahmad Madani (RA) and received all the Adhkar from him and then received Khi­laafat from Hadhrat Maulana Sayed Asad Madani (RA). Shaykh (DB) also par­tic­i­pat­ed in mak­ing the pro­gramme Sched­ule for the Tab­lighi tour of Shaykhul Islam Hadhrat Maulana Syed Husain Ahmad Madani (RA) com­ing to Gujarat, with Hajji Ibrahim Patel (RA) of Kosam­ba. Shaykh (DB) went to Deoband to ben­e­fit from Shaykhul Islam Hadhrat Maulana Syed Husain Ahmad Madani (RA) before he passed away, he stayed with Shaykh ul Islam (RA) con­stant­ly for 4 months doing Dhikr, Adhkar. When Haji Ibrahim Patel (RA) came to Deoband from Kosam­ba to meet Shaykhul Islam Hadhrat Maulana Syed Husain Ahmad Madani (RA), he men­tioned that he didn’t think that Shaykh (DB) would stay for such a long time because of the cold weath­er in Deoband, Shaykhul Islam Hadhrat Maulana Syed Husain Ahmad Madani (RA) smiled and said that he Shaykh (DB) will com­plete the whole year in Deoband. When Shaykhul Islam Hadhrat Maulana Syed Husain Ahmad Madani (RA) passed away Shaykh (DB) made inten­tion to leave Deoband and go back home but Maulana Syed Asad Madani (RA) etc gave mash­wara to not has­ten in going back home, and to stay in Deoband, because of the mash­wara Shaykh (DB) decid­ed to stay in Deoband and com­plet­ed one whole year, even though the fam­i­ly were per­suad­ing him to return back home, as stat­ed by Shaykhul Islam Hadhrat Maulana Syed Husain Ahmad Madani (RA) that he will com­plete the whole year in Deoband, it was his bless­ings. Shaykh (DB) also par­tic­i­pat­ed in the Janazah of Shaykhul Islam Hadhrat Maulana Syed Husain Ahmad Madani (RA) . Shaykh (DB) was very close to Shaykhul Islam Hadhrat Maulana Syed Husain Ahmad Madani (RA) and his fam­i­ly, they were like part of his own fam­i­ly. After the demise of Shaykhul Islam Hadhrat Maulana Syed Hus­sain Ahmed Madani (RA), Shaykh (DB) ben­e­fit­ed from Hadhrat Maulana Abdul Qadir Raipuri (RA) and Hadhrat Maulana Zakaria Kand­helvi (RA) by attend­ing their Majalis. Shaykh (DB) accom­pa­nied Hadhrat Maulana Sayed Asad Madani (RA) on Tab­lighi tours in India, Bangladesh, UK etc. Shaykh (DB) got Khi­lafat from Hadhrat Maulana Sayed Asad Madani (RA) in the year 1961 and he is one of the Senior Khal­i­fas of Hadhrat Maulana Sayed Asad Madani (RA). Shaykh (DB) has Ijaazah in the 4 Sil­si­las, Chishtiya, Qadriya, Naqsh­bandiya, Sohar­wardiya. Shaykh’s (DB) teach­ings of Azkar are based on Chishtiya Sil­Si­la. Those who got Bay’at to Hadhrat Maulana Sayed Asad Madani (RA), he used to tell them to take Adhkar and keep spir­i­tu­al con­nec­tion with Shaykh (DB). If some­one request­ed Hadhrat Maulana Sayed Asad Madani (RA) to lead Zikr Majlis, Hadhrat Maulana Sayed Asad Madani (RA) would ask them to do Zikr Majlis in the com­pa­ny of Shaykh (DB). After grad­u­at­ing from Madrasah as a Alim Shaykh (DB) was invit­ed to teach Alim class Kitaabs (because of his capa­bil­i­ty), by then Mohtamim (Prin­ci­pal) of Dab­hel Madrasah Grand Mufti e Gujarat Mufti Isma’il Bis­mil­lah (RA) in Jamia Islamia Tal­im uddin Dab­hel, but with respect Shaykh (DB) declined because of some per­son­al issues and Shaykhul Islam Hadhrat Maulana Syed Husain Ahmad Madani (RA) also advised Shaykh (DB) to stay in Kosam­ba as Imam. Pri­or com­ing to Eng­land UK, Shaykh (DB) stayed as a Imam in Kosam­ba Gujarat India where he served the peo­ple of Kosam­ba for about 17 years (1953 -1970). Shaykh (DB) came to Wal­sall Eng­land UK in the year 1970, to serve the com­mu­ni­ty of Wal­sall as an Imam & Ustaadh (teacher). He served the com­mu­ni­ty of Masjid Al-Farouq for About 3 years and the com­mu­ni­ty of Masjid Abu bakr for about 13 years. Shaykh (DB) was also invit­ed by Maulana Yusuf Mota­la Saheb (DB) to teach in Darul Uloom Bury but the com­mit­tee mem­bers of the Masjid refused to let him go, they per­suad­ed him to stay and serve the peo­ple of Wal­sall. Allah Ta’ala made Shaykh (DB) the means of Hadhrat Maulana Sayed Asad Madani (RA) com­ing to the UK. After com­ing to Wal­sall Eng­land UK Shaykh (DB) request­ed Hadhrat Maulana Sayed Asad Madani (RA) by writ­ing let­ters, to vis­it UK, so that the peo­ple in UK can ben­e­fit from him, at first Hadhrat Maulana Sayed Asad Madani (RA) declined, but then he made mash­w­era with Haji Ibrahim Patel (Rah­mat­ul­lah Alaih) of Kosam­ba say­ing “Shaykh (DB) is per­suad­ing me to vis­it the UK,but the envi­ron­ment in the UK is not good” Haji Ibrahim Patel (Rah­mat­ul­lah Alaih) gave mash­w­era that “go Insha Allah the peo­ple of UK will benefit”,so he decid­ed to come over. Hadhrat Maulana Sayed Asad Madani (RA) first vis­it to Eng­land UK was in 1971. Shaykh (DB) sent a invi­ta­tion to Hadhrat Maulana Sayed Asad Madani (RA) to vis­it UK every year, Hadhrat Maulana Sayed Asad Madani (RA) ful­filled the invi­ta­tion request of Shaykh (DB) by vis­it­ing UK every year, except for a few years in between. Regard­ing Shaykh (DB), Hadhrat Maulana Sayed Asad Madani (RA) used to say that ‘he is my main host’. When Shaykh (DB) was in India, he was active­ly involved with Jami­at Ula­ma e Hind. he was the Sec­re­tary of Jami­at Ula­ma e Hind in Surat Dis­trict , he was also in the man­age­ment Com­mit­tee of the Jami­at. In the UK Shaykh (DB) was active­ly involved in Jami­at Ula­ma Britain, he was the Gen­er­al Sec­re­tary and Allamah Khalid Mah­mood (Damat Barakatuhum) from Man­ches­ter was the Pres­i­dent, Shaykh (DB) was told to take the the post of Pres­i­den­cy (because of expe­ri­ence for work­ing for the Jami­at in India) but declined to take the post, Shaykh (DB) also held the post of vice Pres­i­dent. Shaykh (DB) also found­ed Wifaqul Ula­ma. Shaykh (DB) is also the Patron of many oth­er Orga­ni­za­tions. Shaykh (DB) has also been active in the work of Dawah (Tab­ligh), Shaykh (DB) has trav­elled to to the fol­low­ing country’s for the noble cause of Dawah (Tab­ligh): India, Pak­istan, Bangladesh, Indone­sia, Aus­tralia, Cana­da, Amer­i­ca, South Africa and many Euro­pean coun­tries. As the cold win­tery sun set on the 28th of Decem­ber 2017, so did the frail and frag­ile bea­con of Ilm and Hidayah which had been shin­ing bright­ly for the past 9 decades, deliv­er­ing the mes­sage of Qur’an and Sun­nah, come to a steady grind­ing halt on the blessed eve of Jum­mat­ul Mubarak, leav­ing behind an ocean of fol­low­ers in floods of tears that could not have been held back at any cost. It was as if a busi­ness­man who has a very impor­tant meet­ing to attend and car­ries on look­ing at his watch to make sure he doesn’t get late, Hadhrat con­tin­u­ous­ly had been ask­ing which day it was today and what time it was? He had men­tioned that Shaykhul Islam Hadhrat Maulana Hus­sain Ahmad Madani (RA) is wait­ing for him to take him to meet the blessed Prophet Sal­lahu Alay­hi Wa Sal­lam. Whilst on his death bed, he start­ed to pre­pare for his jour­ney to the next world by begin­ning his Esha salah only to leave it incom­plete and slip into the next stage of life leav­ing many spir­i­tu­al orphans shed­ding tears behind with real­i­ty kick­ing in that what a price­less gem they had just lost right before their eyes. It was a befit­ting trans­la­tion of the Hadith, ‘Kama tahy­ow­na tamootoon’ (you will die doing what­ev­er you done as you lived). Hadhrat’s life had been all engrossed with the remem­brance of Allah. Every­one who was attached to Hadhrat Maulana Hasan Sahib Rah­mat­ul­lahi Alayh in one way or anoth­er, will have very fond and unique mem­o­ries of Hadhrat. On this first night of Hadhrat hav­ing depart­ed from the sur­face of this world and with the small town where his tem­po­rary abode was, feel­ing very hol­low, shal­low and emp­ty, I will attempt to share a few expe­ri­ences to con­tribute to the trib­utes that have been pour­ing in, from around the world in dif­fer­ent shapes and forms, in order for us to get an idea of what a great pil­lar of Taqwa and Tawaqqul he was, whilst he spends his first night in the grave which will be turned into a gar­den from amongst the gar­dens of Jan­nah Insh’Allah. Our link with Hadhrat goes a very long way back. I was for­tu­nate enough to be named by him the day I was born. He was the first Alim/Scholar that I wit­nessed in my life when I opened my eyes of child­hood. A great role mod­el that would fre­quent our house from the 70’s. After my late father pur­chased one of the first Masjid in Wal­sall in 1975, he employed Hadhrat as the main Imaam after not­ing the high lev­el of piety and Taqwa Hadhrat had with­in. The town wit­nessed the fruit of this appoint­ment by wit­ness­ing the great bunch of Huf­faz, Hadhrat was to pro­duce. Much of the great work we see today is all tes­ti­mo­ny to the efforts and enthu­si­asm of Hadhrat’s self­less labour in the days where coal was used to heat up old build­ings, warm water for wud­hu was scarce and toi­lets used to be detached at the bot­tom of the long gar­dens where snow was shov­elled away by who­ev­er got up first in the morn­ing to use it. Such were the hard­ships. Through Hadhrat, we were intro­duced to Hadhrat Maulana As’ad Madani RA and enlight­ened by his fuy­ooz and barakaat. The fre­quent trips to Heathrow with Hadhrat to receive Hadhrat Maulana Asad Madani RA in late 70’s ear­ly 80’s are mere fond mem­o­ries which have had long-last­ing pos­i­tive impacts. Hadhrat was a com­pi­la­tion and hold­er of many great qual­i­ties. Despite his old age, he was well versed in his Qur’an mem­o­ri­sa­tion and recita­tion. He used to cor­rect the huf­faz in taraweeh. He would nev­er engage in back­bit­ing and would always change the sub­ject if any­one was engaged in it. If any­one ever hurt his feel­ings due to any rea­son, he would for­give them for the sake of Allah and nev­er bur­den him­self by har­bour­ing any ill feel­ings towards any­one. He was an Aal­im ba Amal, an Aamil, a Da’ee, a Sufi and much more. His reg­u­lar Zikr Majlis in the Idara con­sist­ed of not only humans but there were occa­sions were Jin­naat who were stu­dents of Shaykh Hus­sain Ahmad Madani RA also felt it nec­es­sary to attend. I was able help numer­ous patients who were afflict­ed by var­i­ous ail­ments via Hadhrat’s amaliyaat. He was always will­ing to help any­one in dis­tress whilst he could, regard­less of who he was and nev­er had any desire for any finan­cial remu­ner­a­tion in return. His love for those around him was so immense that he would con­tin­u­ous­ly pick up the phone and call me at home regard­less of the time of day or night and share thoughts and ideas about any on going issues or just even to check on how I was doing. Subhan’Allah such self­less­ness and lev­els of piety can only be the signs of great Wal­i­ul­lahs. I remem­ber the day I went to share with him that I was going to go to Darul Uloom Deoband for Dora. His face was gleam­ing with joy and shin­ing with Noor. He shared many fond mem­o­ries of the time he had spent there and gave advice on how I could max­imise the ben­e­fit. He was extreme­ly delight­ed for me and promised that he would write let­ters for the elders there for me take, which he did. After grad­u­a­tion when I came to vis­it him again, he was extreme­ly delight­ed to see me and he shared the news with me that he had found out from Deoband that I had came sec­ond posi­tion in exams from my class. Hadhrat was always very hos­pitable and hum­ble. Dur­ing vis­its to his house he would serve the tea him­self by mix­ing the water and milk togeth­er and offer it along with oth­er refresh­ments. He nev­er had any desire for fame or pub­lic­i­ty but he had a deep love for his Shaykh and his fam­i­ly. He would men­tion their names with great rev­er­ence and affec­tion. When he took out his Sanads of Hadeeth and put them on dis­play, he proud­ly ordered me to read the sanad out that was giv­en to him by his Shuy­ookh and request­ed me if I could make a sim­i­lar one that he could give to his stu­dents and those close to him. Ya Rah­man Ya Rahim Ya Ar-Hamar-rahe­meen Ya Akra­mal Akrameen I want to go into Jan­nah. Save me from Jahan­nam. All of you make sure that you stay stead­fast on Deen. Nev­er go astray from Deen. Do not cry when I leave. Do not wor­ry about me I have served Allah well. I am about to leave. Even the Prophet Sal­lahu Alay­hi Wa Sal­lam depart­ed from this world. How can I stay. Now it’s my time to leave this world. O Allah Paak I want to go into Jan­nah. Save me from Jahan­nam. O Allah bless me with Jan­nah and pro­tect me from Jahan­nam. Tell every­one not to wor­ry about me once i go. Look your father has passed away as well. He was my close com­pan­ion for many years. He has gone and now it’s my turn. I am about to leave as well. Allahum­ma inna nas’aluka ridaaqa Wal-Jan­nah. Subhan’Allah, many on their death beds are encour­aged by their familes to utter the Kalimah and even that becomes a task itself. Here is an exam­ple of Da’ee who is giv­ing Dawah to the those around him as he is depart­ing this tem­po­rary abode. Dur­ing that night Hadhrat also spoke to Hadhrat Maulana Arshad and Asjad Madani DB over the phone and informed them of his desire and wish to go into Jan­nah and to be pro­tect­ed from Jahan­nam. After the phone call he said to me to tell them not to trou­ble them­selves to come and vis­it him, as if he knew that he will have long gone by then and start­ed his jour­ney for the Here­after before they are able to arrive Subhaan’Allah! As I depart­ed from Hadhrat, he recit­ed the Dua of bid­ding some­one farewell; Astow­di Ulla­ha Deena­ka wa Amaanata­ka wa khaaa­teema Ama­lik, just as he always would do. After Maghrib on Thurs­day evening, I received a mes­sage from one of my stu­dents who had devot­ed him­self for the khidmah of Hadhrat say­ing, ‘Hadhrat’s health hasn’t been good at all today. Please con­tin­ue mak­ing Dua’. Doc­tors had be plan­ning to send him home that day but Allah had oth­er plans. That evening dur­ing Esha Salah, Hadhrat depart­ed for the Here­after to begin the eter­nal life. With­in min­utes, news of his demise spread like wild­fire around the world with trib­utes pour­ing in with flash­backs and great mem­o­ries of Hadhrat being rekin­dled. Whilst tying the strip of cloth around his head it remind­ed me of some­thing that I had done with my late father and Hadhrat’s life long com­pan­ion and dear friend, not too long ago. Wal­sall had nev­er wit­nessed such a mas­sive Janazah before. The coun­cil had put up mes­sages on Twit­ter for peo­ple to be aware of the traf­fic con­ges­tion due to the Janazah. There was a heli­copter fly­ing over­head. Coach­es had been pro­vid­ed from the Masjid for those that didn’t have their own trans­port to fer­ry them to the grave­yard. Thou­sands of peo­ple flocked from all cor­ners of the coun­try to gain their share of barakah from this Janazah. Despite the short time slot, the salah was delayed 15 min­utes due the sheer amount of peo­ple rush­ing to the grave­yard to make it on time. Even with the great crowds of atten­dees hud­dled up in their win­ter coats and wool­ly hats brav­ing the fierce cold air of a sun­ny win­ter after­noon, there was a pin drop silence with a very somber mood. Every­one was reflect­ing over their mem­o­ries and attach­ments with this great hum­ble Wali of Allah whom they had come to say their farewells. Hadhrat Maulana Yusuf Mota­la Sahib DB was to lead the Janazah. With the first Allahu Akbar, there was an instant glow of the win­tery sun which came out from behind the clouds as if it was to sig­nal its farewell too. After the bur­ial many peo­ple were still arriv­ing in large num­bers into the grave­yard full of tears, very remorse­ful that they had missed the Janazah due the miles of tail backs. There were queues of traf­fic as far as the eyes could see. They said that every­one was being turned away from the round­about and told that the Janazah was over. Upon hear­ing of the demise of such a great Schol­ar, many queried that how come we didn’t know about such a great Wali of Allah dur­ing his life­time? Well such great per­son­al­i­ties do not rely on the mer­cy of bill­boards, posters, adver­tise­ments or videos for pub­lic­i­ty but they dwell in the hearts and souls of those that recog­nise their lofty sta­tus close to Allah. Hadhrat Maulana Muham­mad Hasan Bod­han­wi R.A., a grad­u­ate of Jamia Islamia Dah­bel has passed away. Inna lil­lahi wa Inna Ilay­hi Rajeoon. Maulana Muham­mad Hasan Bod­han­wi R.A was a res­i­dent of the well-known vil­lage of Surat Dis­trict, Bod­haan. He was born in 1930. He began his edu­ca­tion from the local school and mak­tab in the vil­lage. Maulana’s father was a very pious indi­vid­ual who was very obser­vant his deen. Maulana lost his father when he was 12 years old. He father would say to his friends that I want my son to become an Alim (Schol­ar). Maulana’s father would wake him up ear­ly in the morn­ing when he used to get up for taha­jjud and make Maulana mem­o­rise the Qur’an. Maulana mem­o­rised his Qur’an by Maulana Hafiz Musa Amee­ji R.A. and got admit­ted into Gujrat’s famous edu­ca­tion­al insti­tute, Jamia Islamia Taleemud­deen Dah­bel in 1943. Maulana Ibrahim Godar­wi R.A., Maulana Faza­lur Rah­man Deoban­di R.A., Mufti Ismail Bis­mil­lah R.A. were from amongst Maulana’s teach­ers. From begin­ning till his grad­u­a­tion, Maulana R.A. was a dili­gent pupil who would adhere to Shari­ah and was well liked by the teach­ers. Allah had blessed Maulana with a great tal­ent for mem­o­ri­sa­tion and he was from amongst the well-accept­ed pupils of the Madras­sah because of his piety and san­i­ta­tion. When this writer was in the year of Mishkaat Sha­reef (2nd last year), Maulana was in Dora-e-Hadeeth (final year). We both stayed in the liv­ing quar­ters of Jamia in room no. 42. Maulana was always a jol­ly per­son who was very polite who showed affec­tion towards his com­pan­ions. Food used to be dis­trib­uted from the kitchen of Jamia and stu­dents from every room would col­lect their lunch and sit and eat with their room­mates and there­after take turns in wash­ing their plates. Although Maulana was of a high cal­i­bre, he nev­er detest­ed clean­ing his room or wash­ing the plates. Hadhrat Maulana Abdul Jab­bar A’azami R.A. and Maulana Abdur Ra’oof Peshawari R.A. used to deliv­er Bukhari Sha­reef lessons and they both would keep a close eye on him out of affec­tion for him. Hadhrat Maulana Abdul Jab­bar A’azami R.A. would trav­el to dif­fer­ent parts of Surat and Bharuch on Thurs­day evenings to deliv­er lec­tures. His talks were well-accept­ed there­fore peo­ple used to gath­er in large num­bers to lis­ten to him. Out of love for Maulana Hasan Sahib and me, Hadhrat Maulana R.A. used to take us both along with him and for our tar­biyyah, he would instruct us to deliv­er a 15 minute talk each, after the Qur’an recita­tion and before Hadhrat Maulana R.A’s talk. We ben­e­fit­ed great­ly from this very kind ges­ture of Hadhrat Maulana R.A. May Allah reward them with the very best. Dur­ing exam­i­na­tions, Muhaa­dithul-Asar Hadhrat Maulana Yusuf Ban­nori R.A. was very thrilled when he saw Maulana Hasan’s exam papers and gave 52 marks. He said that I know the total marks that are giv­en are either 50 or 51 but this pupil has pro­duced such an remark­able exam paper that I have giv­en him an addi­tion­al mark from myself. We learn from the records of Jamia that Maulana used to always come first in his class in all the exams. He came first in his final year as well. From the begin­ning, Maulana had a cheer­ful and inno­cent char­ac­ter. He had a habit of pray­ing in the front row for Salah and was very punc­tu­al for his lessons. He had beau­ti­ful cal­lig­ra­phy there­fore his writ­ing books were well pre­sentable. After grad­u­a­tion from Dah­bel, Maulana left for Deoband and gained knowl­edge from well-known schol­ars such as Shaky­hul Islam Madani R.A., Maulana Ibrahim Balyawi R.A., Maulana Ejaaz Ali Amroohi R.A. Qari Hifzur Rah­man R.A. Hadhrat Madani R.A. blessed Maulana with his spe­cial chain of author­i­ty (in Hadith). Dur­ing his stay in Deoband, he would go and sit in the lessons of Shayhkul Hadith Maulana Zakariya R.A.
After grad­u­a­tion he start­ed teach­ing. I can­not recall where he taught ini­tial­ly but lat­er he taught for sev­er­al years in the mak­tab in Kosam­ba. When­ev­er Hadhrat Shaykhul Islam Maulana Hus­sain Ahmad Madani R.A. would tour Gujrat, Haji Ibrahim Patel from Kosam­ba would organ­ise his entire tour there­fore Hadhrat R.A’s first stop used to be Kosam­ba. Maulana Muham­mad Hasan Sahib had deep love for Hadhrat Madani R.A. hence he would accom­pa­ny Hadhrat dur­ing his tour. He per­formed bay’ah with Hadhrat and became punc­tu­al with the azkaar. After the demise of Hadhrat, he built a con­nec­tion with Hadhrat Maulana Sayyad As’ad Madani R.A. and was blessed with Khi­laafah which he was enti­tled to. We used to say that he was a Wali by birth because we were well aware of his great char­ac­ter­is­tics. I was aware of his high cal­i­bre and great poten­tial in edu­ca­tion, there­fore I endeav­oured to get a com­mit­ment from him to teach Ara­bic books in Darul Uloom Fala­he Daarayn but he would always give the same reply that give me a chance to do istikhara and I will give you reply. I was very frank and open with him so I used to say to him that I know that in your istikhara you will see Janab Ibrahim Patel Sahib. He would smile it off. Maulana was also invit­ed to teach in Jamia Dah­bel. He had a very pro­found love for the entire fam­i­ly of Hadhrat Madani R.A. and would feel blessed in being able to serve them. After Hadhrat Madani R.A. passed away in 1957, Maulana went to Britain and start­ed deliv­er­ing lessons and serv­ing the work of Deen in Wal­sall. He would always organ­ise the tour and accom­pa­ny Hadhrat Maulana Sayyad As’ad Madani R.A. dur­ing his vis­its of UK. Maulana As’ad Madani R.A. first vis­it­ed in 1974 and after him, it con­tin­ued with Hadhrat Maulana Arshad Madani R.A. I used to trav­el to Britain and stay at Saeed Bhai Kalang’s house in Wal­sall. Saeed bhai would invite my friend Qari Muah­m­mad Usman Surati, Maulana Muham­mad Hasan Sahib, Maulana Ghu­lam Muham­mad Sahib Baar­doli and Maulana Abdul Awal Sahib, for break­fast where we would have a very friend­ly catch-up. After Maulana fell quite ill, we would pay a vis­it to Maulana’s house and request him for Duas. After all, the promised time arrived and on 10th Rabius Thani 1439 coin­cid­ing with 29th Decem­ber 2017 he hand­ed over his life. Inna lil­lahi wa Inna Ilay­hi Rajeoon. I called his son for con­do­lences and he told me that he had seen Hadhrat Shaykhul Islam Madani R.A, in his dreams a week ago and he had said to him that you will arrive by me very soon. Maulana had prayed Esha Salah and with a tas­beeh in his hands doing Zikr, he closed his eyes and said farewell to this tem­po­rary abode. May Allah for­give him, have mer­cy upon him, bless him and enter him into Jan­natun Na’eem through His mer­cy and bless­ing. It was only a few days ago that we heard the dis­tress­ing news of Dr. Mustafa A’azami R.A. pass­ing away and now we received this heart-wrench­ing news. Al-Mutan­ab­bi the poet said: “Those that were beloved to us depart­ed before us. The cure for death star­tled every doc­tor. Numer­ous schol­ars and those that were in touch, attend­ed the Janazah Salah from var­i­ous places around the coun­try. The Khal­i­fah of Hadhrat Qutubul Aqtaab Shaykhul Hadith Maulana Zakariya R.A., the founder and Shaykhul Hadith of Darul Uloom Bury, Hadhrat Maulana Yusuf Mota­la Sahib lead the Janazah Salah. Many peo­ple were deprived of the Janazah. The sheer num­ber of peo­ple attend­ing this Janazah in Britain was a sign of accep­tance, close to Allah.